With Classic Menu for Word 2010, you will enjoy the old look of Word 2003, XP (2002) and 2000. It shows classic menus and toolbars on the ribbon of Microsoft Word 2010, and brings back the classic view and old interface. It makes Word 2010 look like 2003, XP and 2000. If you are used to the old interface (main menu, standard and formatting toolbar), sometimes it is very difficult to locate the command item which you want to process. It is very easy to deploy the software to client computers in your enterprise or organization. You don't need learning, trainings or tutorials any more when you begin using Microsoft Word 2010. 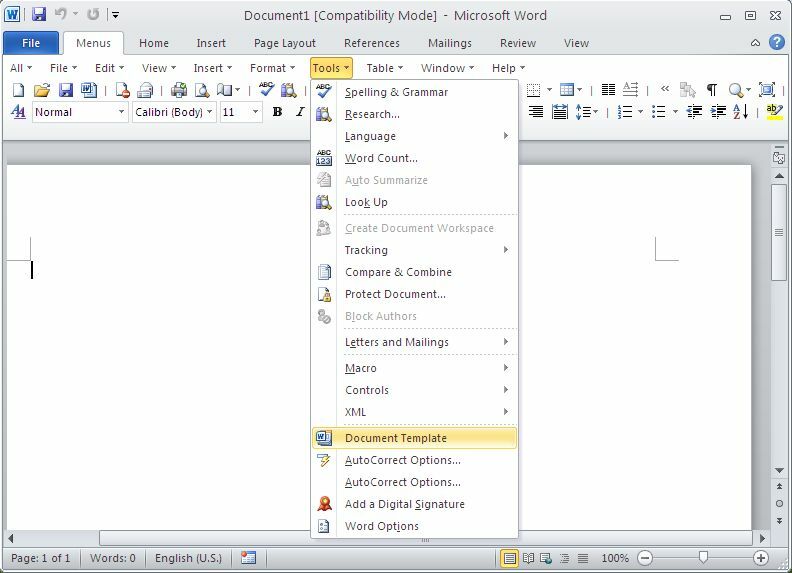 All new features of Word 2010 have been included in the classic menus, and you can still enjoy many Word 2003, 2000, 2002 and 2007 functions which have been removed from the ribbon of Word 2010 by Microsoft. Users can browse the entire menu and call old commands with familiar keyboard shortcuts. They just need to simply insert Q into the original shortcuts of Word 2003. More Features: 1. Easy to install and uninstall; 2. Easy to show or hide tabs of the ribbon; 3. Easy to show or hide the menus and toolbars; 4. You can change the position of the classic menus tab; 5. Combine 32-bit and 64-bit Classic Menu into one single Exe installation package, so that users don't need to know whether they are using 32-bit or 64-bit Microsoft Office 2010. Combine 32-bit and 64-bit Classic Menu into one single Exe installation package, so that users don't need to know whether they are using 32-bit or 64-bit of Microsoft Office 2010. 6. Supports all languages: English, French, German, Italian, Spanish, Portuguese, Japanese, Dutch, Chinese, and more. This site does not contain serial number, crack, keygen Classic Menu for Word 2010 serial number : serial number is the simplest type of crack. A serial number(cdkey,product key,etc) is register the program as you may already know. a crack or keygen may contain harmful software. If you cannot find the exact version you want, just give it a try. for more information read .nfo/.txt/.diz file include in zipped file.